There are some terms used on this site that might be confusing to those new to Speedcubing. This refers to how easy it is to move the cube faces. Some cubes have very slick surfaces and can move so easily it can be difficult to control. These would be considered "very fast." Cubes that feel gummy and are more difficult to move are considered slow but are often easier to control. Speed cube pieces have the ability to move slightly without the whole puzzle falling apart. This ability is called corner cutting. Many 3x3 speed cubes on the market today can push one face back into alignment by moving another. Those have very exceptional corner cutting. Take a look at this slow motion video to get a better idea. Although many cubes can realign themselves with corner cutting they still can "lock up." This is where pieces get caught on each other and cannot easily realign themselves. Cubes with very square pieces can often lock up easily. This can also occur with cubes on very loose tensions as well since those pieces can move around easily and can get in positions that are not desirable. Lastly, since the pieces of a cube can move around it is possible for them to pop out completely. It can be caused by loose tensions, rough turning, or be result of the mechanism that is used in a specific puzzle. Most notation for cubing algorithms are use U, D, R, L, B, and F. The reverse is U', D', R', L', B', and F'. This is referring the the side of the cube as well as if it is turning clockwise or counter clockwise. This can look confusing since opposite faces turn opposite ways when looking at it from one direction. lower case or letter follow by w is moving two faces at the same time. Cubes that are said to have a florian mod have curved corners to help the pieces to move more easily around each other. The cube on the left is not florian modded while the cube on the right is. Most cubes produced now have those curves in the pieces when they are molded. In the past cubers would actually have to "mod" their cube with usually sandpaper or a dremel. 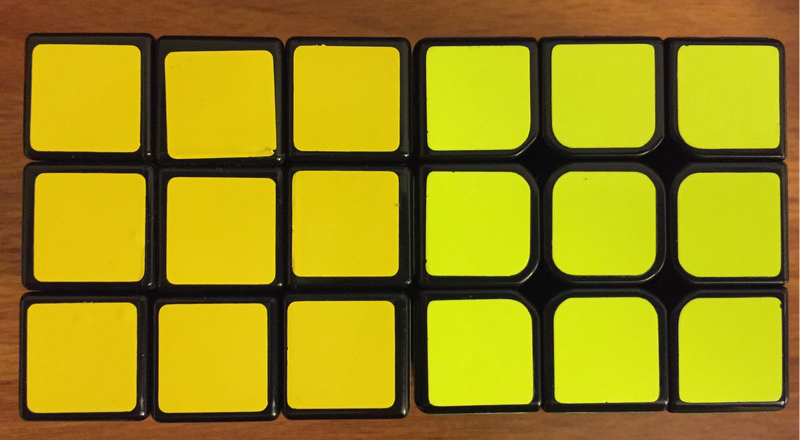 Cubes that are 4x4 and larger can run into patterns that are not possible on a regular 3x3 cube. When edge pieces are paired up they might be paired in a way that makes the cube unsolvable with algorithms a cuber would use on a 3x3. The edge pieces must then be moved around using a special parity algorithm. The 4x4 cube pictured has what is called an OLL parity (Orienting Last Layer). You cannot orient the top layer to have all yellow on top without switching the two edge pieces. There are multiple algorithms that can be used in this case. 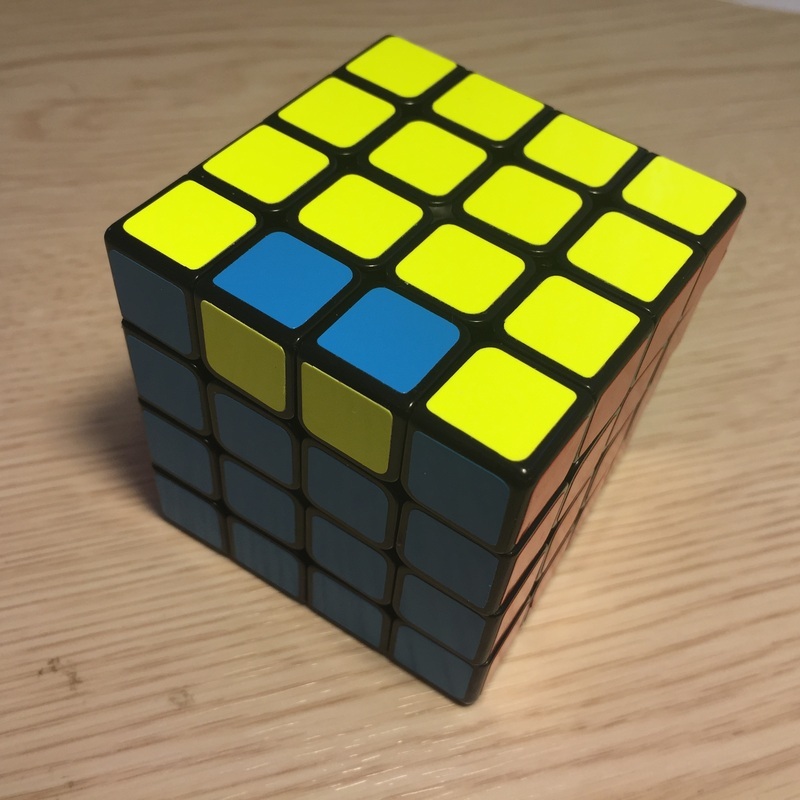 After the last layer is oriented to have the same color facing up the cube can still be unsolvable with regular algorithms. The cube might still have a PLL parity. PLL (Permuting Last Layer) parities are similar to OLL parities as they do not occur in 3x3 cubes. After the top layer pieces are all oriented they must be permuted in to their correct spots. On larger cubes edge pieces could be placed on non-typical locations and a special PLL algorithm that usually switches two opposite edge pieces (eg. yellow-blue and yellow-green flip places) will correct this problem.